Protein powders have made a big splash in the world of sports nutrition. These vitamin and mineral packed powders are being consumed by an ever-increasing population intent on benefitting from them. Moms who don’t have time to eat their own breakfast after getting the kids fed and ready for school and out the door are now downing protein shakes in the morning. Men who have recently taken up a little weight training to stave off middle-aged weight gain are drinking protein shakes in hopes of turning fat into muscle. Even teenagers, notorious for giving a healthy diet a bad name, are drinking protein shakes for their supposed nutritional value. Now, that being said, if come Thursday afternoon and you don’t have the time or motivation to make a chicken salad, a protein shake made with protein powder can make a better meal than grabbing a muffin and coffee from the local deli. The same holds true for breakfast. If you can’t sit down to a bowl of yogurt with fresh fruit salad, a protein shake is definitely better than skipping the meal altogether. So if you do indulge in a few protein shakes every week, here are some tips to get the most out of your liquid meal. 1. Try out all the different protein powders available and stick with the ones that agree with you best. 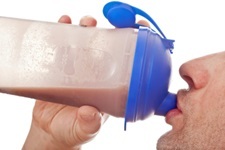 Protein powders made from whey are the most common type you’ll find on store shelves. Whey is a by-product of cheese manufacturing. Whey contains all the amino acids that your body needs to build muscle and other types of tissue. 2. Soy protein is another commonly used base in protein powder mixes. Soy protein is good for those who are practising a vegetarian diet. Soy protein also contains all the amino acids needed by your body. 3. Casein protein, like whey, comes from dairy, and is about 92% pure protein. It takes longer to digest casein so it may not be the best choice just before a big workout. 4. Brown rice protein could be appealing for those with gluten or lactose sensitivities. Brown rice protein contains amino acids but isn’t a complete protein like whey or casein. 5. Hemp protein is also gluten and lactose free. It also contains good amounts of omega-3s and 6s. Hemp protein is a source of B vitamins and iron too. 6. Yellow pea protein is another alternative for those who are vegetarian or vegan. Beck, L., “How can I get the most out of protein powder?” The Globe and Mail web site, Aug. 18, 2013; http://www.theglobeandmail.com/life/health-and-fitness/what-the-best-protein-powder/article13820378/, last accessed Sep. 11, 2013. “Alert: Protein drinks. You don’t need the extra protein or the heavy metals our tests found”. Consumer reports 2010; 75 (7): 24–7.